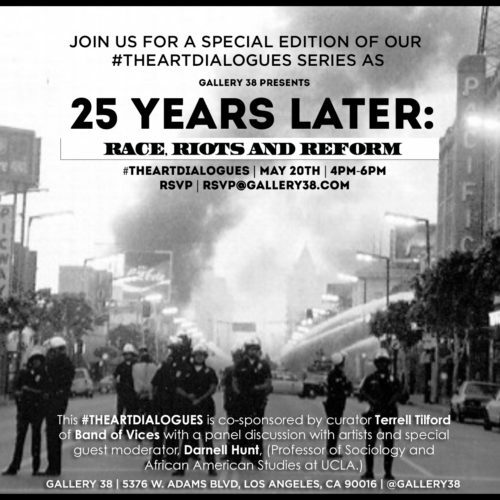 The Art Dialogues – a discussion on the 1965/1992 LA Riots – co-sponsored by Curator Terrell Tilford and moderated by Darnell Hunt, PhD., this Saturday, 20th of March at Gallery 38. This event is FREE and open to the public. We will be surveying clips from both riots as edited by contributor Reginald A. Coleman. Featured panelist: Darnell Hunt is chair of the Department of Sociology, director of the Ralph J. Bunche Center for African American Studies, and Professor of Sociology and African American Studies at UCLA. Dr. Hunt has written extensively on race and media, including numerous scholarly journal articles and popular magazine articles. He has also published four books about these issues: Screening the Los Angeles “Riots”: Race, Seeing, and Resistance (Cambridge University Press, 1997), O.J. Simpson Facts and Fictions: News Rituals in the Construction of Reality (Cambridge University Press, 1999), Channeling Blackness: Studies on Television and Race in America (Oxford University Press, 2005), and (with Ana-Christina Ramon) Black Los Angeles: American Dreams and Racial Realities (NYU Press, 2010). Prior to his positions at UCLA, he chaired the Department of Sociology at the University of Southern California (USC). Over the past two decades, Dr. Hunt has worked on several projects exploring the issues of access and diversity in the Hollywood industry. He was lead author of the Bunche Center’s 2014, 2015, 2016 and 2017 Hollywood Diversity Reports, which provide comprehensive analyses of the employment of women and minorities in front of and behind the camera in film and television. He authored the last six installments of the Hollywood Writers Report, released by the Writers Guild of America (WGA) in 2005, 2007, 2009, 2012, 2014 and 2016. He was principal investigator of The African American Television Report, released by the Screen Actors Guild (SAG) in June of 2000. He has also worked in the media and as a media researcher for the U.S. Commission on Civil Rights’ 1993 hearings on diversity in Hollywood. Recently, he has worked as a consultant on film and television projects focusing on sensitive portrayals of race, ethnicity and other social issues. Dr. Hunt received a bachelor’s degree in Journalism from USC, an MBA from Georgetown University, and a Ph.D. in Sociology from UCLA. A native of Washington, D.C., he has lived in Los Angeles for the past 30 years.